Manufactured by Maximum these wind speed sensors have proven themselves in wind tunnel tests, in mountain-top tests and in thousands of household and institutional installations to be rugged, reliable and highly accurate. The type #41 generator has recorded wind to 214 MPH. Their low moment of inertia and unique bearings permit very rapid response to gusts and lulls. With pulse, frequency or AC current output. The black Lexan cups (virtually shatter-proof) have thermal properties which let it resist and shed icing far more effectively than metal assemblies. Because of their output linearity these sensors are ideal for use with various data retrieval systems. The experience that Maximum has built up over the years has provided the basis of our solid confidence in these sensors for a wide variety of applications. 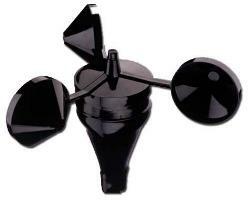 Maximum anemometers and NRG Wind Vanes are often used in conjunction with each other as medium range but high quality wind sensors.